technical analysis but is the fundamental cornerstone of all stock market technical analysis. The odds are that a trend will continue so a trader increases his odds of a winning trade by trading in the direction of the current trend. By drawing trend lines we can stay in a trade for longer and hopefully catch a larger move in stock prices. When price does then break back through the trendline it can be taken as an early warning of a possible reversal in prices, enabling us to get out of a trade with a larger slice of the profits intact. Learning how to draw trend lines is pretty straight forward. 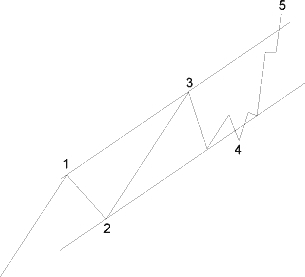 A trend-line is a line drawn between at least two points on a stock chart where price has previously found support or resistance. The more touches a T/L has the better, as this shows confirmation of its value. When drawing a trend line, choose two significant high or low points on the chart and draw the line extending it as far as required. 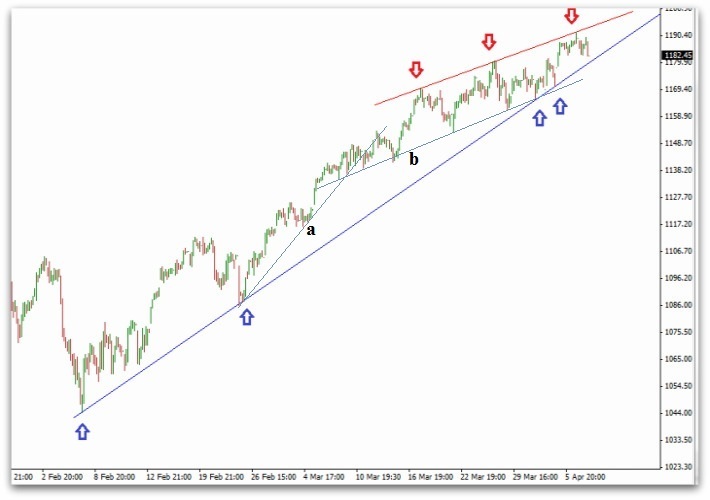 If a trend trader bought this chart somewhere above the second Blue arrow he would have been able to stay in the trade with no worries, and would be nearly 100 x S&P500 points better off, simply by drawing the Blue trend-line and waiting for price to break the trend before exiting his position. Trend trading is ideal for swing trading and longer term investments. In this case there is a trend forming resistance across the highs, so the market is either going to need something to push it up through resistance to continue the trend, or there may be a break down in prices coming. How to draw trend lines as the trend develops. 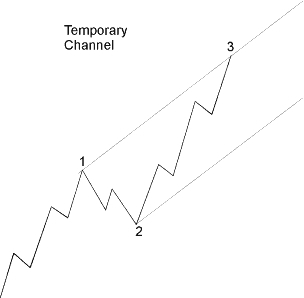 How to draw trend lines - channels -Trending stock prices are very likely to fluctuate withing a price channel. 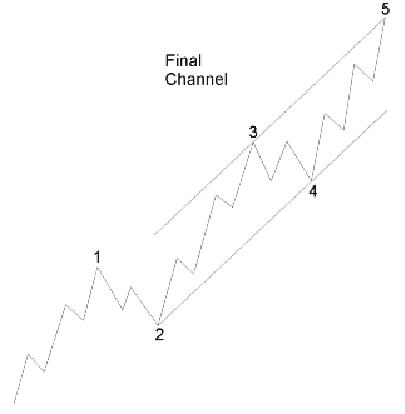 A channel is produced by drawing trend lines parallel to an existing trend-line creating a price channel. Once we had drawn the parallel to our Blue trend-line from the previous chart, we would have created this price channel and by using this method we would have been expecting resistance when price hits the upper trend line again (where the first Red arrow is). Prices did find resistance at this point but never broke back down through the lower channel trend line keeping the larger up trend intact. When prices then make a second significant high we should then redraw our channel to reflect the possible slowing or change of trend. 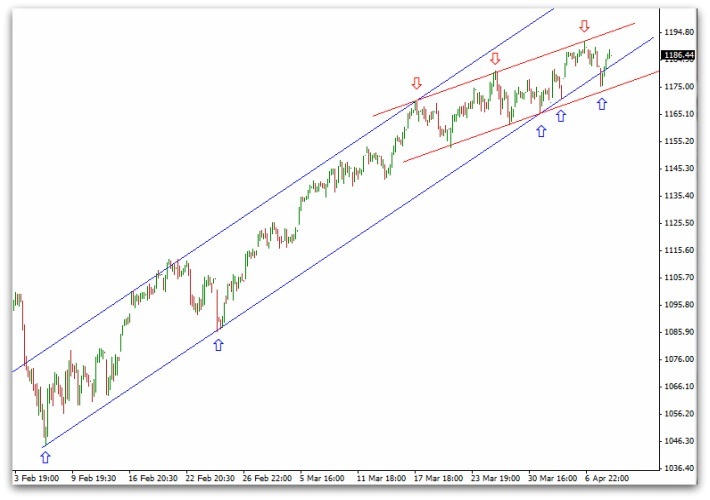 In this example we can see the trend is weakening as the lower Blue T/L has been breached but overall up trend remains intact as prices are still being supported within the redrawn channel. That's exactly how I chose this excerpt from EWI's Basic Tutorial to show how clear the writing and illustrations are. The one best place to start learning about wave analysis is this online tutorial, which is available to all Club EWI members -- a membership that is free and that brings you many resources about the kind of technical analysis and forecasting that we do here at Elliott Wave International. 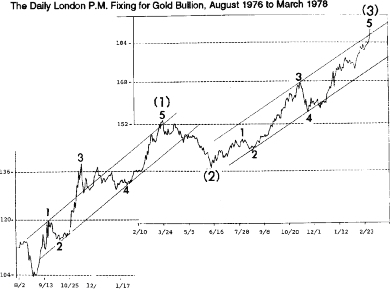 Throw-overs are occasionally telegraphed by a preceding "throw-under," either by wave 4 or by wave two of 5, as suggested by the drawing shown as Figure 2-10, from Elliott's book, The Wave Principle. They are confirmed by an immediate reversal back below the line. Throw-overs also occur, with the same characteristics, in declining markets. Elliott correctly warned that throw-overs at large degrees cause difficulty in identifying the waves of smaller degree during the throw-over, as smaller degree channels are sometimes penetrated on the upside by the final fifth wave. Examples of throw-overs shown earlier in this course can be found in Figures 1-17 and 1-19.